How is a Twin Pregnancy Different from a Singleton Pregnancy? What a great question. There are distinct differences between the two, and taking a multiple-birth specific class, either in your community, on-line or by DVD will answer many of your questions. As each pregnancy is different, even for the same woman, there may be differences woman-to-woman and/or situation-to-situation. IF YOU ARE NOT SURE ABOUT ANY ASPECT OF YOUR PREGNACY, PLEASE CONSULT YOUR PHYSICIAN IMMEDIATELY. Here are some expected differences. Nutritional requirements are different for a multiple-birth pregnancy and your doctor or nutritionist will be able to explain how much weight gain is ideal for you in each trimester. Your particular weight gain expectation will be influenced by how many fetuses you are carrying. Mothers may need to spend some time on bed rest either at home or in the hospital. Your doctor will let you know should you fall into this category. Expecting two or more? Dr. Franklin has a light-hearted, easy to understand writing style, generously laced with humour. Her book takes you through each stage of the pregnancy. She includes chapters on learning the news that you’re having multiples, “…and What To Do About It”, she addresses issues you might expect to face in each trimester of your pregnancy, focusing on nutrition, exercise, and preparing for the babies. Expecting Twins, Triplets, and More is like having a friend, who also happens to be a doctor, share her experience and expertise to help you best take care of yourself and your babies at this very special time. Dr. Rachel Franklin’s practical wisdom helps you understand the unique circumstances of multiple pregnancy and birth. Throughout and after your pregnancy, Expecting Twins, Triplets, and More will act as an invaluable resource on what to expect, how to cope, and how to enjoy the journey. Twin to twin transfusion syndrome (TTTS) is a random abnormality of a monochorionic placenta that causes one identical twin to receive less than normal amounts of blood supply during pregnancy while the other receives too much. The babies share blood vessels in their placenta that cause an imbalance of blood flow and nutrients between them. There are degrees to the severity of the syndrome, but it is always life-threatening due to the fact that it can worsen at anytime during pregnancy. Below is a summary of the difference between dizygotic (fraternal) and monozygotic (identical) twin pregnancies. TTTS can only happen with monozygotic twins, or as a pair in a higher multiple pregnancy, that share a single monochorionic placenta. NOTE: The following information is provided for your information only and does not necessarily reflect each person’s individual situation. If you have any concerns whatsoever about your pregnancy, please consult your physician immediately. two eggs meet up with two sperm. These babies are technically siblings who happen to have been born at the same time. They are commonly known as “fraternal”. They always have one placenta each and are called dichorionic (DC). one egg meets up with one sperm. These babies are always the same gender and are commonly known as “identical”. MZ pregnancies can experience high complication rates, particularly if the twinning process occurs more than 4 days from fertilization resulting in a single monochorionic placenta share by two or more babies. When the embryo randomly splits between 4-8 days after conception, the pregnancy results with two babies each in their own amniotic sac (diamnionic) as well as sharing a placenta (monochorionic). The majority of these pregnancies proceed without complications. However, approximately 15% of the time, the babies will share blood between them disproportionately and warning signs of the syndrome will appear on ultrasound (see warning signs below). The syndrome can occur with two or more babies in a higher multiple birth pregnancy as long as the babies share a single monochorionic placenta. When the embryo randomly splits between 8-12 days after conception, the pregnancy results with both babies sharing a single placenta (monochorionic) but the babies are in the same amniotic sac (monoamniotic). 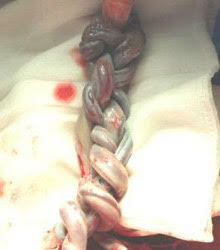 This type of pregnancy can still result in TTTS but it is more difficult to diagnose with the babies in the same sac. Also, there is a greater concern that the babies’ cords will become entangled. It is estimated that approximately 50% of the babies will pass away from cord entanglement. It is recommended that mothers be hospitalized at 24 weeks for 24 hour monitoring of the babies until they are born. One of the warning signs of TTTS shown on ultrasound is a size difference in the babies. One baby, the donor, becomes restricted in growth receiving less then normal blood flow. The donor baby does not urinate very much and has little to no fluid in his or her amniotic sac. Sometimes the baby is referred to as a ‘stuck twin’ or having oligohydramnios. Subsequently, a much larger blood flow goes to the co-multiple, referred to as the recipient twin. Due to the shared, interconnecting veins and arteries in the single placenta, the blood disproportionately flows through the donor twin and collects in the recipient twin, who is unable to efficiently rid his or herself of the extra blood. The recipient baby urinates frequently causing too much amniotic fluid or polyhydramnios. Because of this abnormality in the placenta, both babies’ well-being can be severely compromised. It is important to understand that one reason babies can become growth restricted is that the babies may share the placenta itself unequally. The donor baby could have less then half of the placenta to nourish it. This is one reason why The Twin to Twin Transfusion Syndrome Foundation advocates weekly ultrasounds from 16 weeks through delivery of the babies. If a baby has a small placental share, and you cannot know prior to birth for sure what the placental share is, the baby will get to a certain gestational week and it will stop growing. The baby will not get enough blood and oxygen from it s share of the placenta to ‘get bigger’ than the size that it is. The rate of growth for the babies is extremely important and is often overlooked. The sharing of the blood from the syndrome also adds to size differences of the babies. TTTS is often combined with an unequal placental sharing. LASER SURGERY which identifies the connecting blood vessels in the shared monochorionic placenta and cauterizes them with a laser beam. The babies are being separated in the placenta so each will then get their blood supply independently from the other. The scope used is inserted through amniotic cavity of the recipient baby. There are specific criteria that must be met based on ultrasound findings. BEDREST AND NUTRITION which is explained below and combined with the therapies listed above. Make sure your obstetrician has plenty of high-risk pregnancy experience. Make sure that your obstetrician uses intensive ultrasound to determine the chorionicity (DC or MC) of the babies as early as possible in the pregnancy. If the babies are like-sexed, you need to know if they share a placenta or each have their own. If they share a placenta, weekly ultrasounds are crucial in the care of your babies and you may have to really fight to have them. Don’t take no for an answer. If the babies are unlike-gender, they must be fraternal twins and cannot have TTTS. Keep asking questions until you are satisfied and understand the answers. If your babies are monochorionic, take really good care of yourself. One way is to follow advice from Dr. Julian De Lia who pioneered laser surgery almost 20 years ago. He is now recommending adding protein drinks to your diet, such as 3 cans of Boost drinks a day. He feels that TTTS can make mothers malnourished adding to the fluid problem around the recipient babies. Drinking the protein can help get the protein in your blood back to normal. Many women have seen improvements from this. Nutrition is completely overlooked by most doctors. Bedrest is also strongly encouraged along with adding liquid protein. Bedrest is defined as laying horizontally on your left side and getting up to eat, shower, use the bathroom, and go to appointments. Laying on your left side takes pressure off of your cervix and helps increase blood and oxygen to the placenta to help your babies. Make sure that your cervix is checked weekly. This is also overlooked by many doctors. If your cervix length shortens to 2cm or less, a cerclage or stitching of the cervix can be done up through 25 weeks. This has saved many pregnancies. Laser surgery can still be done after a cerclage only through the 26th week. If early signs of TTTS appear, or there is a sudden increase in your size, ask for a perinatology appointment immediately. Your feto-maternal medicine specialist will know about the options for treatment. Ask what they think about possible laser treatment and whether this is a possibility for you. Once again, don’t take no for an answer. It is also encouraged by The TTTS Foundation to contact the laser doctors on your own so you get the correct and up-to-date information directly from the doctors who perform the procedure. Understand a monochorionic placenta and what TTTS is. Understand specifically what is happening to your babies with measurements of their size difference, your fundal height, the biggest pocket of fluid around each baby, where your placenta is located in the uterus, their doppler readings and your cervix. Create a medical plan of action with back-up plans so you can be as prepared as you can for each appointment. The TTTS Foundation says that without treatment, the death rate for twins who develop TTTS at mid-pregnancy (16 to 26 weeks gestation) may be as high as 80-100, mostly as a result of premature delivery. The later the condition develops in the pregnancy, the better chance the babies have since they could be delivered if signs of distress are present. Your health care professional is the best source of information regarding your personal situation and can discuss fully with you how your situation can be managed. However, remember that the ultimate decisions for your children are yours. Please also note that TTTS can occur with monozygotic (identical) sets of babies in triplets, quads or quints and not just twins. If you are pregnant with multiples, you need to know if you are carrying any monozygotic babies and if they have TTTS. Diamniotic twins: twins who have developed in separate amniotic sacs. They may be either dizygotic or monozygotic. Dichorionic twins: twins who have developed in separate chorionic sacs. They may be either dizygotic or monozygotic. Dizygotic twins: twins formed from two separate zygotes. Monoamniotic twins: twins who have developed in a single amniotic sac. These twins are always monozygotic. Monochorionic twins: twins who have developed in a single chorionic sac. These twins are always monozygotic. Monozygotic (monozygous) twins: twins formed from a single zygote. Oligohydramnios: the presence of too little amniotic fluid around a baby. Polyhydramnios: the presence of too much amniotic fluid around a baby. A very informative discussion of 30 minutes in length about TTTS, what it is and what it may mean for babies and Mom.This educational program featuring Dr. Ahmet Baschat from University of Maryland Medical Center, can be heard at: http://www.patientpower.info/listenhealthtopicdetails.asp?showid=UMMC040609&Topic=Pregnancy%20Issues.